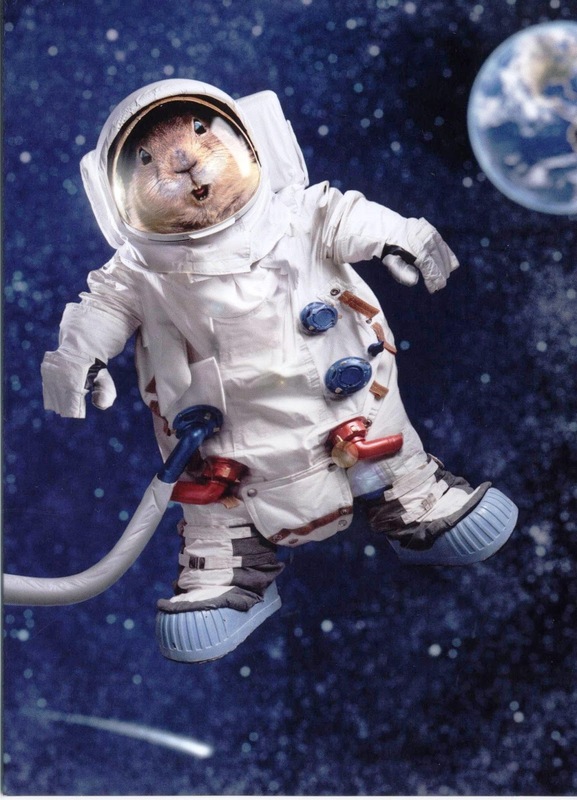 AstroCryptoTriviology: A Jones for MOL #5: A MOL, not a chipmunk. A Jones for MOL #5: A MOL, not a chipmunk. been breathing pure oxygen in the A7L NASA-style spacesuit. Credit: Avanti Press, 2011, avantipress.com. The presence of helium in the gas mixture of the Manned Orbiting Laboratory’s internal atmosphere has enabled four decades of amused speculation that the two MOL pilots would have sounded like Alvin, Simon and Theodore when they spoke to each other or with their ground controllers. Substituting helium for nitrogen in breathing gas mixtures for deep-sea diving (to help prevent oxygen toxicity and nitrogen narcosis) is well-known to cause speech distortion, especially under high atmospheric pressures (ref. 1), so it has been assumed the same would be true onboard MOL. The famous example of astronaut-turned-aquanaut Scott Carpenter’s telephone conversation with President Lyndon Johnson, in which the president betrayed no hint of any struggle to understand the explorer’s squeaky voice, was the result of Carpenter’s presence in a decompression chamber at 89 psi of heliox at 20% oxygen and 80% helium, after his 30-day sojourn at a depth of 200 feet (61 m) in Sealab II (refs. 2,3) (I was surprised to find out that the high pressure alone would not have increased the frequency; ref. 4). The U.S. Air Force investigated voice quality and other aspects of candidate MOL atmospheres before settling on the final gas mixture of 70% oxygen and 30% helium at 5 pounds per square inch (psi). A complex of connected altitude chambers at Brooks AFB in San Antonio, Texas, for prolonged habitation was laid out like the MOL with an adjacent area to accommodate “ground control” (ref. 5). A smaller “space cabin” at Wright-Patterson AFB in Dayton, Ohio, was used for brief studies (ref. 6). Subjects for these studies, at least at Brooks, were “informed volunteers” drawn from the available population of young, fit basic trainees at nearby Lackland AFB (ref. 7). My last blog described the Air Force’s process of selecting helium as the diluent for MOL’s atmosphere. Helium’s relative inertness, unusual heat coefficient and reduced solubility in body water and fat all recommended it as a substitute for atmospheric nitrogen even at reduced cabin pressures (ref. 1). Voice quality characteristics of interest included distortion, attenuation and error rate between airmen within the cabin and by external monitors using headsets (ref. 1). An Air Force study (ref. 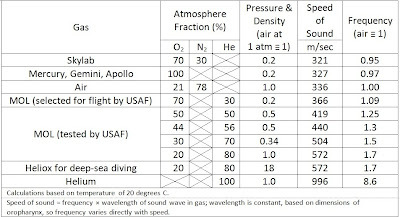 1) of a 50% oxygen, 50% helium mix at 7 psi (slightly less than ½ atm) for up to 12 hours found no greater incidence of communication problems than in pure oxygen at 3.5 psi or 5 psi (as would be used in US EVA suits and US spacecraft, resp., through the end of Apollo). Fatigue of the test subjects, who were awakened early and spent a long day in the chamber, was judged to cause the same degree of problems. Another study (ref. 8) evaluated almost the same atmosphere, 44% oxygen and 56% helium at 7.8 psi (½ atm), in 4 subjects but for 14 days this time. On average, the fundamental and second formant frequencies of the voice, which would largely determine voice pitch, were higher in helium than in air, but the fundamental decreased toward its pre-exposure value over the two-week confinement. In fact, the fundamental frequency in one subject dropped and remained at or below baseline for most of the study. A third study (ref. 6) of bioacoustics during 5-8 hours at 30%, 50% and 70% helium atmospheres at 258, 360 and 760 mm. Hg (0.34, 0.5 and 1 atm) found over 50% increase in voice formant frequency at both 30% and 50% helium, and 90% increase at 70% helium, consistent with other studies. Those studies dealt mostly with higher helium fractions and shorter exposures than a MOL mission would entail. A more realistic Air Force study (ref. 9) confined 4 subjects for 56 days at the selected MOL atmosphere. Only 1 subject showed a marked rise in the fundamental frequency of his voice over the 2-month confinement, although all 4 exhibited increases in their second formant frequencies. Soviet investigators had also investigated an unspecified helium atmosphere, even before the Air Force tests, in which the voice pitch of the test subjects was reported to be increased “seven tenths of an octave, but the distortion was tolerable” (ref. 10). I spent a little time Googling articles about voice quality to understand what “seven-tenths of an octave” corresponded to in terms of “cycles per second” but just came away confused. The Soviet study aside, at least the Air Force studies were consistent in their conclusions that, even if the voice frequency were increased, intelligibility was more influenced by background noise, and crewmembers learned to modify their speaking styles to minimize the effects of the helium, the noise and the lower cabin pressure. What’s more, the frequencies in the MOL pilots’ voices would be increased only 9% compared to air, much less than that observed in the divers (see table below) (ref. 11). The MOL pilots would have been breathing almost exactly the opposite ratio of the gases used by deep sea divers whose voice quality derives from the higher proportion of helium with its low gas density and high velocity of sound. So, no chipmunks or Donald Duck on MOL. Cooke, J.P., and S.E. Beard, “Verbal Communication Intelligibility in Oxygen-Helium, and Other Breathing Gas Mixtures, at Low Atmospheric Pressures,” Aerospace Medicine, 36(12): 1167-1172, Dec. 1965. “LBJ & the Helium Filled Astronaut,” Produced by Larry Massett, http://www.npr.org/programs/lnfsound/stories/991015.stories.html (accessed 22 Mar 2006). The NPR website incorrectly listed the date as 1964, but it was September 27, 1965. See also Carpenter, S., and K. Stoever, For Spacious Skies (Orlando: Harcourt, Inc., 2002), p. 321. 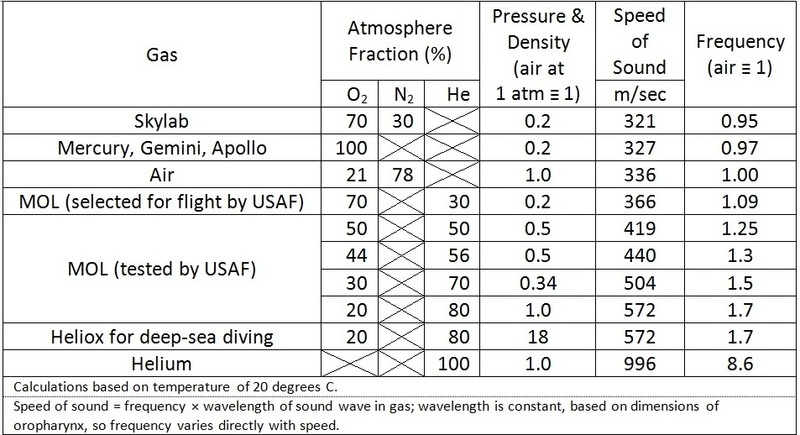 Speed of sound formulas, http://www.engineeringtoolbox.com/speed-sound-d_82.html (accessed 14 Aug. 2012). Nunneley, S.A., and J.T. Webb, “Aerospace Medicine at Brooks AFB, TX: Hail and Farewell,” Aviation, Space and Environmental Medicine 82(5, sec. 1): 567-570, May 2011. Nixon, C.W., and H.C. Sommer, “Subjective Analysis of Speech in Helium Environments,” Aerospace Medicine 39(2): 139-144, Feb. 1968. Barry, S.J., and J.E. Endicott, “Comparison of Speech Materials Recorded in Room Air at Ground Level and in a Helium-Oxygen Mixture at a Simulated Altitude of 18,000 Feet,” Aerospace Medicine 40(4): 368-371, Apr. 1969. Nixon, C.W., W.E. Mabson, F. Trimboli, J.E. Endicott and B.E. Welch, “Observations on Man in an Oxygen-helium Environment at 380 mm. Hg Total Pressure: IV. Communications,” Aerospace Medicine, 39(1): 1-9, Jan. 1968. __, “Helium Test,” Aviation Week & Space Technology, Nov. 23, 1964, p. 25. This conclusion is drawn from calculations based on information in two sources: Hess, D.R., J.B. Fink, S.T. Venkataraman, I.K. Kim, T.R. Myers and B.D. Tano, “The History and Physics of Heliox”, Respiratory Care, 51(6): 608-612, 2006, http://www.rcjournal.com/contents/06.06/06.06.0608.pdf (accessed 7 Aug. 2012); and Speed of Sound in a Gas http://www.electronicsteacher.com/succeed-in-physical-science/sound/speed-of-sound-in-a-gas.php (accessed 7 Aug. 2012). A Jones for MOL #6: Not Quite a Vacuum.